Once upon a time a Canadian author invited us to join him in a very exciting, but dangerous journey, to a world created by his fantastic imagination. We packed our bags and on January 15, 2015, we visited for the first time the Underworld of the city of Florence in “The Prince.” Little we knew then what Sylvain Reynard had in mind for us because, as he mentioned in a Facebook chat a week ago, it was all part of the plan. If you want to know what “the plan” was all along, you will have to read The Roman! For those who haven’t read the Florentine Series, now’s the time. Ask Santa to get you all the books, and witness the powerful and transcendent love story of the most improbable lovers. Two lovers who found in each other hope. Their differences only complimented each other to become a better version of themselves. Raven and William are soulmates, and their love is breathtakingly and beautifully penned through the Florentine Series. No matter if you’re a new reader, or you’ve been reading his stories for a while, I believe we all agree: Sylvain Reynard never disappoints. After seven books, I think it’s safe to say his writing style drags you into a magical and unforgettable world. A world that once you get to experience, you don’t want to let go. 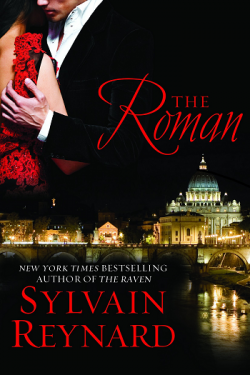 As always, in “The Roman,” you’ll end up wanting more. Will it always be this way? Always wanting more of these fascinating stories? I believe so. I also believe there’s more to say in this story. Our hero and heroine deserve more, and we definitely aren’t ready to let them go for good. Raven starts a new journey at the end of the book that I’d love see in more detail, and be part of it. I love character growth because we can learn so much from it. And in SR’s hands, we can rest assured, we’ll find the wisdom and hope that sometimes we so desperately look for. Thus, I’m really hoping for a fourth book in the future. The Roman is a fast-paced story full of action, angst, betrayal, sacrifice, unconditional and powerful love, a burning passion, renewed hope and redemption! Unexpected plot twists will surprise you here and there. Every word, every scene, takes you into an emotional roller coaster so deep, that it’ll get under your skin like a tattoo and stay in your mind like an indelible mark. You’ll never be the same after reading stories as profound as Sylvain Reynard’s. His poetic and flawless writing style is pure delight to all your senses. The character’s development through the series is simply moving and incredibly well-developed. William is the lover we all dream for, and Raven deserves someone like William, someone who admires and worships her as he does. His Cassita will fly in so many ways, and his love for her will spread her wings to soar. William’s love for Raven will break your defenses, too. It’s inevitable to not fall for William York. But life isn’t perfect, and to live a love like this has a price to pay … Will they be willing to defend their love against all odds? Las Alondras and I, at Noches en Florencia FP, knew we had to be part of the book reviewers for the last book in The Florentine Series. We want to tell everyone, especially the Spanish reading community, that without a doubt, this series is a wonderful read as is the Gabriel Series. You won’t want to miss it! If you’re bilingual and you haven’t read the whole series, do it now. Don’t wait any longer! From all SR’s books in both series, in my opinion this is his best work so far. Simply fascinating. My admiration and most sincere congratulations to Sylvain Reynard. I’m in awe and completely blown away by this story. Raven and William will always be part of me. I give The Roman a gazillion of stars. This story is simply perfection. The rest of the series (in order) is: The Prince, The Raven and The Shadow.